Mainstream news outlets often get games wrong. This has been discussed. And discussed. And discussed, again, this week. 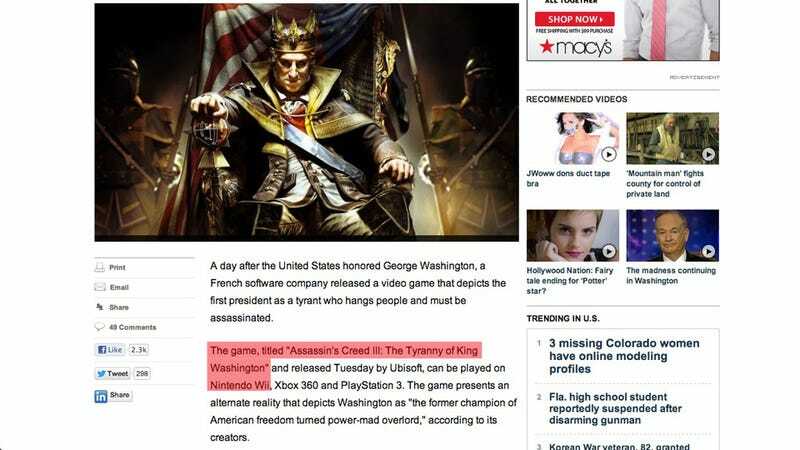 The Assassin's Creed 3 article that Fox News published earlier this week is atrocious for so many reasons. Yes, it's xenophobic, somehow making the phrase "French company" sound like dirty words. Yes, Fox clearly tried to twist it into something that it's not. And to top it off it's chock-full of simple factual errors. I think that's what bothers me the most—that no one at Fox could even be bothered to get the facts straight before attempting to besmirch yet another game. The article refers to "The Tyranny of King Washington" as a standalone game, which it's not, and says that it's available for "Nintendo Wii," which it's not. It's that simple. In light of everything else, it shouldn't be that big a deal. But for some reason they continued to irk me, like a painful boil begging to be lanced. Instead of just staring, I decided to try to do something about it. Poking around on Fox's website, I found this page on how to submit story corrections. Late on Tuesday I tweeted (here and here) at the @foxnews account and emailed the indicated address. As of Sunday afternoon, the errors remain. When someone points out an error in one of my articles, I correct it as soon as possible. Hell, I try not to make errors to begin with—obviously. And I try to reach out to the article's subjects if I feel further discussion or clarification is warranted. Fox News did not do these things. I even confirmed with Ubisoft that Fox did not so much as reach out to them for comment. Representatives for Ubi didn't seem too perturbed by Fox's article, though, particularly given the positive tone of the spokesperson from George Washington's Mount Vernon estate with whom Fox did speak. I'd guess Fox's reporters expected outrage from the folks who help to uphold Washington's legacy, but there was none to be found. I hate to pick on Fox News—okay, that's not totally true, but still—because they're hardly the only offenders in this area. Just search for the outdated term "computer game" on most non-enthusiast news sites and you can see how out of touch many otherwise modern reporters are. I went through what I believe are the normal channels by submitting these errors to the Twitter account and email address listed on the Fox News website earlier this week, but they have not yet been fixed. I was hoping to learn from you what the standard turnaround time for fixing factual errors in online articles is, and find out how important factual accuracy is in Fox News's online reporting. Apologies for the short notice on this request but I wanted to give until the end of the week for the errors to be corrected before reaching out—if you get back to me after I publish my article I will amend it with your input. Thank you! So far I haven't heard anything.